President Obama has organized an executive draft to increase regulations for the handling, mixing, and storing of the hazardous chemical ammonium nitrate. Ammonium nitrate is the chemical that is responsible for the deadly explosion that occurred in April at a Texas fertilizer plant. Ammonium nitrate is a hazardous material that is very toxic and deadly. According to a White House fact sheet issued today, August 1st, 2013, the explosion at the fertilizer plant in West, Texas is a “tragic reminder that the handling and storage of chemicals present serious risks that must be addressed”. A number of fatal explosions have emphasized the threat of the hazardous chemical, ammonium nitrate. Ammonium nitrate is common in agricultural environments and widely used in the fertilizer industry, antibiotics and industrial explosives. Ammonium nitrate should be segregated from combustible materials to avoid hazardous situations. The hazardous chemical is an oxidizer which means that it accelerates the burning of combustible materials. Ammonium nitrate should be stored in a cool, dark environment with proper fire suppression systems. 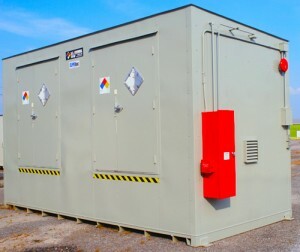 When ammonium nitrate is heated or contaminated by incompatible chemicals, it can explode; therefore a proper and fully compliant chemical storage building must be necessary. Proper maintenance of ammonium nitrate must be scheduled when being stored. Material safety data sheets (MSDS) on ammonium nitrate should be thoroughly read before storing or handling of the chemical. Ammonium nitrate must be stored in a tightly sealed container because of its critical relative humidity of 59.4%. Fertilizer chemical storage buildings by U.S. Chemical Storage provide a safe and secure way to store chemical inventory. Our fertilizer chemical storage building offer an air-tight and leak-proof chemical storage building for housing flammable and explosive chemical inventory. Constructed from heavy-duty, 12-gauge steel and made in America for superior strength and complete durability. Our fertilizer chemical storage building deliver the ultimate storage facility for all of your fertilizer storage needs. Our fertilizer chemical storage building offers 100% customizability for fully compliance. U.S. Chemical Storage can house your fertilizer storage, regardless of the amount of storage. Keep your fertilizer storage and chemical storage safe and maintained with a fertilizer chemical storage building from U.S. Chemical Storage.